looking more like a staircase than a smooth line. 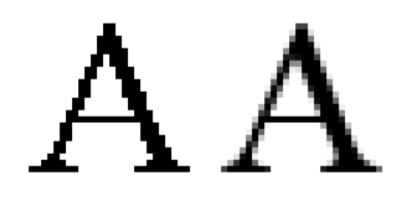 Aliasing (a.k.a. jaggies) can be countered by anti-aliasing schemes in which pixels are drawn in varying shades of gray and, sometimes, diffused over neighboring pixels to yield a smoother-looking image when viewed from sufficient distance, as illustrated by the picture at the top of this page. For example, if y=23.56, then yw =23 and yf =0.56. Also,if y=−1.3,then yw =−2 and yf = 0.7. Let the gray level of a pixel be a number from 0.0 to 1.0 where 0.0 denotes a pure white pixel and 1.0 denotes a pure black pixel. If yf is zero, then shade the pixel (x,yw) at a gray level of 1.0. If yf is non-zero, then shade the pixel (x, yw) at a gray level of 1 − yf and shade the pixel (x, yw + 1) at a gray level of yf . Write a program to draw anti-aliased lines according to this scheme. These numbers will be presented as floating point numbers with no more than 2 digits after the decimal point. m will be in the range 0.00 to 0.50 inclusive and b will be in the range -20.00 to 20.00 inclusive. A zero value for both m and b signals the end of input and is not plotted. The characters, if you have difficulty recognizing them, are: period, colon, hyphen, equals, plus, lower-case T, lower-case W, asterisk, hash, percent, at. yf and the gray level must be computed exactly. When rounding the gray level to the closest tenth, break ties by rounding up. Each line of the plot will be printed as 20 characters, immediately preceded and immediately followed by a vertical bar (‘|’). After each plot, print a single line containing 22 underscore (‘_’) characters.